After watching Alice Through the Looking Glass, I rhetorically asked myself could there be such a thing as a sequel that was worse than the original. I hadn't counted on The Huntsman: Winter's War. I look around and wonder, was there anyone who really wanted more stories about the dull Huntsman, who has no personality and as embodied by Chris Hemsworth, no one to bring anything to life. Yet here we are, following up the pretty dull Snow White & The Huntsman with something that is shockingly bad. 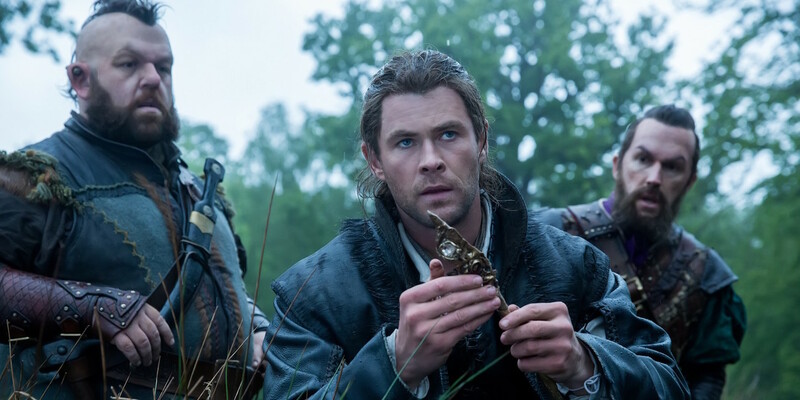 The Huntsman: Winter's War plays like the fevered ramblings of a crazed writer who decided to write some bizarre and boring mashup of The Lord of the Rings, The Lion, the Witch, and the Wardrobe, and even of all things, Frozen. Winter's War is both a prequel and sequel to SW&TH, which makes for shall we say very jumbled viewing. 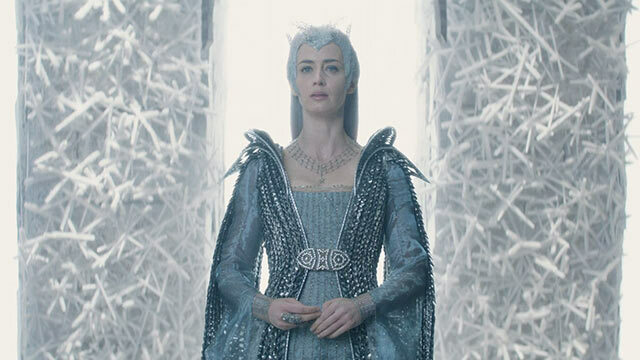 In the prequel part, Queen Ravenna (Charlize Theron, cashing a check) is displeased that her sister Freya (Emily Blunt, also cashing a check) is in love and with child. She is convinced Freya is heading for heartbreak, and that she too has great powers yet untapped. It isn't until Freya discovers that her beloved has burned their child that she explodes into the female Mr. Freeze, and thus Elsa in all but name emerges. I'm serious: the children who were in the theater called her "Elsa" once she went all white and turned everything into an endless winter. As part of her revenge on all mankind she gathers children to her castle by force and trains them to serve as her version of the Republican Guard. They will be her "Huntsmen" (though that term is unisex since her Praetorian Guard includes girls). Among them is Eric (Hemsworth), the titular character, and Sara (Jessica Chastain, who I figure doesn't have a good agent). Eventually, they do fall in love, which violates Elsa's one law: NO LOVE! It appears that Sara is killed by Queen Elsa, and Eric is dumped into the river (though whether they knew he was dead or alive I cannot verify, due to having fallen asleep off and on during the film). It's here where things start getting really, really muddled. We get a quick recap of SW&TH, then bounce seven years later. It seems that Snow is slowly being driven insane by the magic mirror, so she has it sent off to a sanctuary. However, the guard taking the mirror there have disappeared, and Her Majesty has commanded Eric to go fetch the mirror and take it to the sanctuary (and keep it from Queen Elsa's hands too). Eric, however, knows the Frozen Queen's tricks and knows he's being followed. He isn't thrilled to take two dwarves with him, but he does. It is somewhere here that he discovers that Sara is alive and not dead (though again, the actual logic of all that is highly chaotic). They join forces and find the mirror, but it has a dark power over those who look at it. That makes it more imperative they throw it into Mt. Doom...I mean, take it to the sanctuary. Sara, however, after a night of passion with Eric, has betrayed him to Elsa. In another twist, Eric realizes that Sara has not betrayed him because she, who is a mistress archeress, did not kill him (she never misses, we often hear). With that, it's off to the Wicked Witch's castle to destroy the mirror and save Sara. It's here where Elsa uses the mirror and brings Ravenna back, her spirit somewhere between life and death. A battle ensues between them all, especially after Elsa discovers what we all knew from the get-go: she was the one who burned her niece alive (having hypnotized the father to do it). Eventually Ravenna is defeated...or is she? Emily Blunt auditions for Frozen Live! Within ten minutes of The Huntsman: Winter's War at the most, I was falling asleep. It does not help that we get awful voice-over that serves as guide to things we are either seeing or things that are unimportant. Were professional movie-makers involved in this? I have made no secret of my utter hatred for voice-overs, finding that they very rarely work (Sunset Boulevard and Blade Runner being exceptions, but then again those were made by extraordinary directors). This one was made by Cedric Nicolas-Troyan, who makes his feature film debut. He ain't no John Huston, that's for sure. As I was slipping in and out of consciousness, wondering exactly how many other films Winter's War could steal from (Freya turning into Frozen's Elsa, only bitchier; the magic mirror whispering words of temptation to keep it from being destroyed, Freya turning people into statues and wondering where she kept Mr. Tumnus), I thought who seriously could find any of this interesting. It's bad enough when you get good actors in bad films, Theron vamping it up to the Nth degree, Blunt looking almost confused. It's worse when you get bad actors in bad films. As much as Chris Hemsworth is thrown at me as a legitimate thespian, he has yet to make a good film or give a good performance that didn't involve him swinging a massive hammer. I think he was trying to cover up his native Australian accent with some curious Irish lilts, and in the process making himself almost unintelligible. His already deep, growly voice is at times hard to understand, but throw in his efforts to sound like narrator Liam Neeson and it begs for us to have subtitles. Chastain did herself no favors here either, with her own curious accent and dull performance. Hemsworth is almost always dull, so why bother picking on him for failing to deliver once again? It's odd that the film showed things that were never commented on or quickly passed over. In what appears to be a magical forest, we see turtles and snakes made out of grass, but no one appears to notice. When they do, it's to comment on how the fairies will help them race to Freya's castle, as if this is routine. 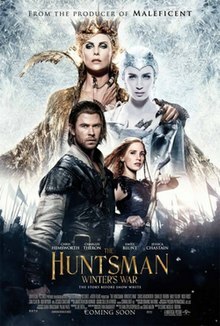 Almost comically bad performances, a boring story with a dull protagonist, it's as if The Huntsman: Winter's War was made to show us that not only was Snow White not necessary, but The Huntsman as well. Whether Kristen Stewart was not asked to return or declined to I cannot say. However, as lousy an actress as she is, at least she can say, "I really dodged a bullet that time".